Location: Host cell cytoplasm after virion entry. 1. The cellular tRNA bound to primer binding site (PBS) of the genomic RNA serves as a primer to initiate reverse-transcription. 2. 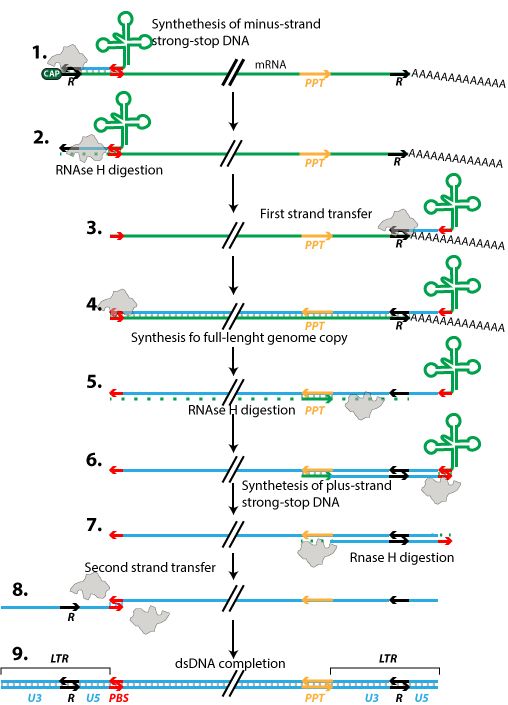 Viral RNAseH degrades RNA hybridized to DNA. 3. The neo-synthesized DNA is transfered and hybridizes to the Repeat® region at the end of the genome. 4. Full-length genome is copied by the reverse transcriptase. 5. Viral RNAseH degrades RNA hybridized to DNA, except the poly-purine tract (ppt) region which is resistant degradation. 6. DNA synthesis resumes using the hybridized ppt RNA as primer. 7. Viral RNAseH degrades the ppt primer and releases the tRNA now hybridized to DNA. 9. Both minus and plus DNA strands are extended to create the full length dsDNA genome called proviral DNA. It remains associated with virion capsids proteins and forms the pre-integration complex (PIC). This complex will enter in the nucleus and integrate the proviral DNA int the host chromosomal DNA. Transcription events: The integrated provirus sequence is transcribed by host RNA polymerase II, and stimulated by the LTR strong promoters. Cell defense: In vertebrate, APOBEC proteins are incorporated into virions and are able to hypermutate the viral genomic DNA by their cytidine deaminase activity.